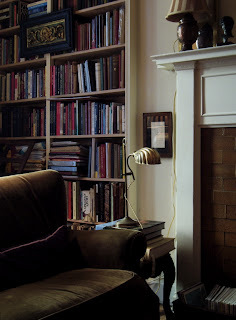 My library sprawls across two built-in shelves on either side of a big mantel, which is rather imposing for the size of the room. The nine foot tall book cases are scaled to keep up with it (the ceiling is almost twelve feet), and practically every inch is stuffed with books. The larger, heavier ones are on the bottom shelves. The music books and scores are on the left, closer to the window, desk and sofa. And the big books on interior design (they are always big) are on the right, near two comfortable chairs. The rest of the books, a mish-mash of everything and anything written by Gore Vidal, have found a place next to each other according to size and category. While my library at home is nearly full, the one in my ibook is not. If you have not already heard, Google is funding the scanning of 20 major libraries - an ambitious project. This means that a vast amount of material in the public domain will be available online. Only last week, I did a search and found a book that I read at the New York Public Library at Lincoln Center. This is going to make research a lot easier, and I dare say, a lot more fun. You will able to sit at home in jammies, with tea and toast, and download dessert (it's rather sweet to be able to perform a word search on a digital file). That said, there are many materials that will not find their way into a database. To find them, you will first have find a librarian. And a good one will save you a lot of time and effort. My own modus operandi is to dress nicely, smile, speak clearly and in complete sentences. It can make a big difference. And isn't it cool that there's more and more public domain material to access? Love it. One can never have enough books! And Upper West Side apts are full of them: I have read (ha!) that there are more books bought here per capita than any other place in the world. Yikes! nobody can have enough books, they make us dream. You words remind me of something Nancy Lancaster once said, which was that a room needed three things to be inviting: a fire, flowers, and candlelight. 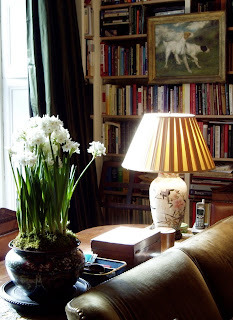 I may have to start a English Country House style blog! Your library is oh-so-'habitually chic'. I love books!!! I love the way you co-operate books and pictures. The pictures are from the flea market, and rotate around the apt. The one of dogs is a current favorite, and is English I believe, signed 1904.